To communicate with a phone system, either a CTI server (Third Party Solution) or the connection of the phone set to the PC (First Party Solution) is supported. For both systems a TAPI driver 2.x (also referred to as TSP) is mandatory. Please check firstly with your phone vendor about which solution meets your requirements and how you can install and configure the TAPI driver. All listed operating systems are supported in the 32 bit and 64 bit version. Windows 8 RT is not supported. Internet Explorer, Firefox and Chrome. For required Browser versions check salesforce online help. The Salesforce Professional, Enterprise, Unlimited or Developer Edition, a force.com or Chatter Plus license is required for the call center functionality. 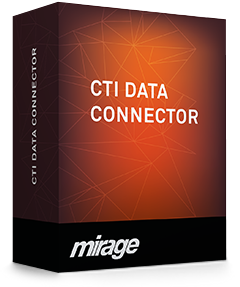 Yes, CTI Data Connector runs on Citrix / Terminal Server (Windows 2008 Server or newer). You have to check with your PBX vendor if the TAPI (TSP) driver is Terminal Server compliant. Once the Cloud Edition subscription is cancelled, CTI Data Connector for Salesforce will stop working.